• It's flexible - variable size webs and our unique H clip allows total core size flexibility; we've already used it to create walls over 1m thick! Insulating Concrete Formwork (ICF) is an innovative, sustainable, high performance building system. Quite simply, it allows fast construction of creative, flexible buildings with low running costs and a long life. 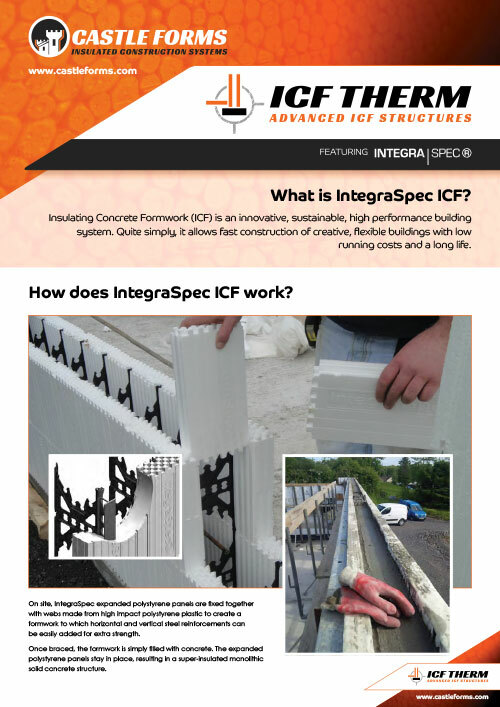 How does IntegraSpec ICF work? On site, IntegraSpec expanded polystyrene panels are fixed together with webs made from high impact polystyrene plastic to create a formwork to which horizontal and vertical steel reinforcements can be easily added for extra strength. Once braced, the formwork is simply filled with concrete. The expanded polystyrene panels stay in place, resulting in a super-insulated monolithic solid concrete structure. Once braced, the formwork is simply filled with concrete. The expanded polystyrene panels stay in place, resulting in a super-insulated monolithic solid concrete structure. 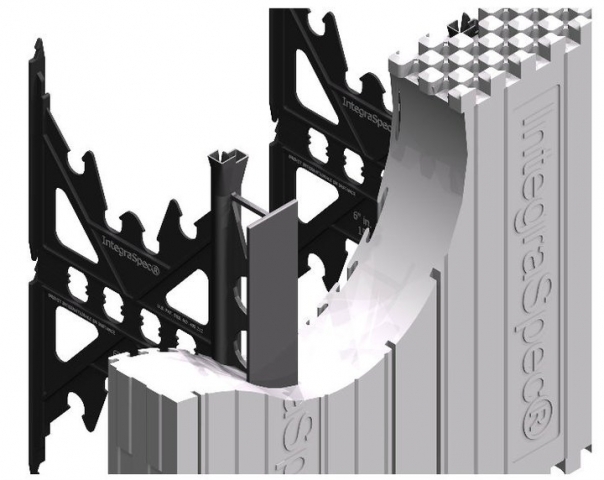 Where can IntegraSpec ICF be used? The flexibility of IntegraSpec ICF means it works well for a wide variety of different building projects. It has already been successfully used in the construction of apartments and houses, care homes, commercial buildings, hospitals, hotels, schools, stables, hot tubs, swimming pools and basements. It’s no wonder IntegraSpec is already the first choice for high performance and sustainability with designers, installers and occupiers across the UK, Europe, America, Canada and Asia. What's the thermal performance of IntegraSpec ICF? temperature fluctuations and stabilise internal conditions). With IntegraSpec ICF, the thermal mass of the concrete combines with the expanded polystyrene insulation inside and out to help keep the structure warmer in winter and cooler in summer. Whatever the external temperature, the heat energy inside the building is continually conserved. What are the U-values of IntegraSpec ICF? In the standard configuration, the IntegraSpec ICF system can offer U-values down to 0.20w/m2k. By adding our unique expanded polystyrene inserts, U-values can be improved toaround 0.10 w/m2k. Does IntegraSpec ICF prevent thermal bridging? Following independent tests for thermal bridging prevention, IntegraSpec has been verified as the best in the UK, with a lower thermal bridge loss than any other building system. What's the fire performance of IntegraSpec ICF? As concrete can’t be set on fire and doesn’t burn, the IntegraSpec ICF system is very safe, providing an excellent level of protection against fire. Depending on the thickness of the concrete core, it can provide up to 3 hours of fire protection. How green is the IntegraSpec ICF system? Up to 1,000m2 of panels can be loaded onto one truck, saving on fuel costs and reducing the carbon footprint.